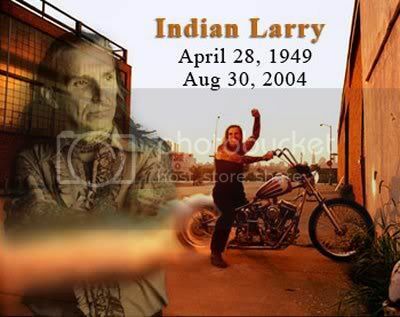 "Indian" Larry Desmedt (April 28, 1949 - August 30, 2004) was a noted bike builder, stuntman, and innovator in the world of custom motorcycles. Indian Larry's final moments occurred during a taping of a televised motorcycle building competition. Indian Larry was performing a motorcycle stunt at the "Liquid Steel Classic" and "Custom Bike Series" in Concord, North Carolina on August 28, 2004. In the stunt, he was standing on the moving motorcycle. As the stunt progressed the bike began to wobble out of control and he was thrown from the motorcycle, sustaining serious head injuries. He was then taken to the Carolinas Medical Center in Charlotte, North Carolina, where he died on August 30, 2004 from the head injuries sustained in the mishap. Larry was not wearing a motorcycle helmet at the time of the accident. Two books were published on Indian Larry in 2006 including "Indian Larry: Chopper Shaman," by Dave Nichols with Andrea "Bambi" Cambridge and photography by Michael Lichter as well as "Indian Larry" by Timothy White. His autobiography, Grease Monkey, The Life and Times of Motorcycle Artist Indian Larry, written shortly before his death, is scheduled for publication. 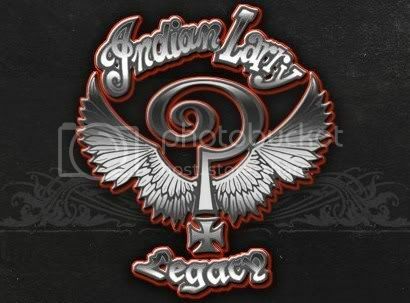 Indian Larry contributed and innovated in the business of vehicle customization. Although no matter how ground breaking his creativity proved to be – Indian Larry was an icon in classic styling. His “retro theme” served to keep alive what was at one time, a dying passion and a fading beauty of mechanics and aesthetics. Larry was invited to be a guest on the Regis Philbin show and also did his famous daredevil stunts during David Letterman's Late Night show. Larry went on to do a few more shows for the Discovery Channel's Biker Build Off series. He was featured on the cover of The Horse/BackStreet Choppers Magazine numerous times as well as Easyriders and just about every big time motorcycle magazine from as far away as Japan and Finland. It was during the weekend last of August 2004 that Larry finished his latest and most spectacular creation, the Chain of Mystery bike for another Biker Build Off. With Larry in the lead riding the bike that he and his talented crew built in just 10 days, they rode from NYC to the Liquid Steel show in Charlotte, NC. At the show on Saturday, Larry entertained a crowd of 8,000 fans by performing his famous stunt show. After thrilling the crowd by riding through a Ring of Fire on his bike, He got on his personal ride, the Grease Monkey and did just one more stunt to please the crowd. He stood up on the seat and surfed the bike down the track. The bike slowed down and Larry was thrown. He suffered a severe head injury as a result and passed away in the hospital the next night surrounded by his wife and friends. Larry left us all too soon. He rode free with the wind in his hair and the sun on his face. Larry was the kind of person that wanted every one around him to be happy. He didn't have to perform that last stunt. He just did it to give pleasure to all the people who came out for the show. People who knew him best, knew what a good genuine person he was. Builders who shared Larry's vision will look to his example for years to come. The people who loved him and knew him on an every day basis will miss his smile and warmth the most. The entire world has lost one of nature's noblemen.